If you’re looking to sample truly local flavours, you need look no further than Pat O’Doherty’s Black Bacon. As with any true dry-cured bacon, the traditional and natural curing process ensures no shrinkage in the pan and none of that white residue that inferior bacon can leave behind. Pat uses rare-breed pigs such as the all-black Wessex pigs and black and white Saddlebacks, alongside Gloucester Old Spots and Tamworths and takes his time with a three-month curing process. 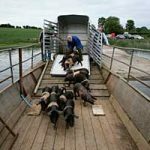 These lucky pigs are reared on their own private island on Upper Lough Erne where they are free to roam and feed on the wild herbs and grasses that give Black Bacon its unique flavour. Visitors can arrange a trip out to see the pigs at Inishcorkish, or simply pick up ‘The Fermanagh Black Bacon Cookbook’ from Coolbeg’s extensive book shelves and celebrate the taste of black bacon every day of your stay. O’Doherty’s also produce real and genuine Irish corned beef. “This is not what you get in a tin”. Cook with mash potato and cabbage, accompanied by a glass of the black stuff for a winter warmer comfort dish. 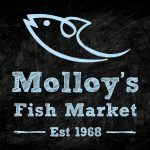 Molloy’s source their fish from Killybegs in County Donegal, Ulster, which lands a huge range of fish and shell fish and they are shipped directly to their Enniskillen branch. Donegal bay mussels, oysters, fresh scallops, mackerel and John Dery are all available daily in season. Northern Ireland has some of the worlds most traditional and varied bread, making traditional; wheaten bread, soda bread, potato farl, soda farl, and treacle bread are some of the treats on offer. There are some excellent bakeries in nearby Lisnaskea and Enniskillen where the emphasis is on home styled bread and quality. Try the Cherry Tree Bakery, 107 Main Street, Lisnaskea, BT92 0JB or Leslie’s Home Bakery, 10 Church Street, Enniskillen, BT74 7EJ. 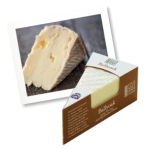 Gold winner of the Great Taste Awards, Fivemile Town Cheese is produced in a modern creamery just over the border in County Tyrone. The cheeses, although pasteurised, are still great and as the creamery says, it relies on two things: “the quality and purity of the ingredients and the skill and passion of the artisans”. The full range of cheeses are available in Fermanagh shops and at the factory shop in Fivemiletown. Ballybrie, Ballyoak, Ballyblue form the core range. The goats cheeses are produced exclusively from Hazel Dunn’s Goat herd in Brockborough, County Fermanagh. The creamery shop is located in Fivemile town postcode: BT75 0RK. Although a trade supplier and without a local retail store, you will find kettyle dry age beef on the menus of Fermanagh’s top restaurants. 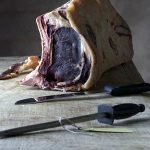 Its excellent 35 day dry aged beef is prepared in Lisnaskea in the only purpose built dry aging facility in Europe. Keep an eye for it on the restaurant menus, a premium and fine taste. Fermanagh Farmers’ Market at UIster Farmers’ Mart (The Cattle Market), Tempo Road, Enniskillen, holds a Farmers’ Market on the last Saturday of every month from 10am to 2pm. Details 07870 998 070. A Farmers’ market is also held on the second Saturday of every month on Tesco car park in Enniskillen. Markets at St George’s in Belfast. The weekly markets run between 6am and 2pm. There are 248 market stalls. The fish section contains 23 stalls and holds the reputation of being the leading retail fish market in Ireland. On Saturdays and Sundays, the emphasis moves to local continental and speciality foods and local arts and crafts. St Georges market makes an excellent provisions stop if arriving in Belfast. 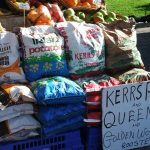 If coming from Knock Airport or the Republic of Ireland try Carrick-on-Shannon which has a farmers market every Thursday from 10am to 2pm.